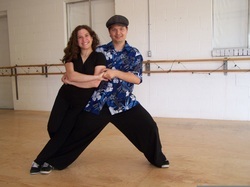 Rick and Meredith are swing dance instructors who relocated here from Albuquerque, NM. They have been dancing for a combined total of 18 years and have learned from the best in the country. These national instructors include: Joel Plys, Virginie Jensen, Evita Arce, Nick Williams and Steve & Heidi. They are excited to bring their experience and knowledge to Jumpin' at the Woodside.